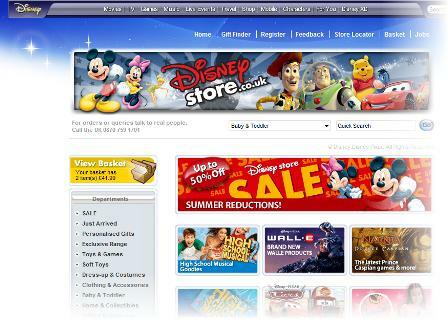 DisneyStore.co.uk is part of the main Disney website, which is presumably a fantastic source of targeted traffic. But is it making the most of this popularity to sell its products online? The answer at this stage is a firm ‘no’, but we have analysed the key areas of the website to recommend a number of improvements that Disney can make to improve the customer experience, which in turn should boost sales. The DisneyStore website forms part of disney.co.uk, but for some reason the design differs from the rest of the site, and the homepage isn’t the most appealing to look at. A white background replaces the blue colour scheme from the rest of the Disney website and gives the impression that the design of the shop hasn’t been updated for a while (2005 was the last major redesign). Really, the store should be on-brand, and feel like part of the whole site, rather than an ugly extension. The site doesn’t make it instantly clear what visitors need to do to navigate through the various categories of products. Customers can navigate through the site in five ways; by clicking on the promoted products on the homepage, using the site search tool, the drop down menu underneath the main logo, and by a navigation bar on the left hand side. They can also click on their favourite Disney characters and search for products related to these. This is a good idea, but many visitors may miss this as it has been placed below the fold. The dropdown menu is not especially user friendly. I’m not a fan of these anyway, but if kept to a small number of options they can be useful for saving space. However, this dropdown has 100+ categories to scroll through, which is way too many. Dropdowns also carry the risk of frustrating shoppers as one wrong click means the menu disappears and the search has to start again. With the search box, the text doesn’t vanish when you click inside it, which is common practice on nay e-commerce sites. This means that the user has to delete the ‘quick search’ text before entering their own search term, which some people will find annoying. It didn’t work very well for a few test queries I tried also. For instance, I search for ‘Prince Caspian games’, already knowing that the store sells video games related to the film. However, the search returned no results at all, not even pointing me towards its Prince Caspian section, which is prominently promoted on the homepage. Fixing this sort of problem is very much low-hanging fruit, and should reap instant rewards for Disney, in terms of conversion rate uplift, and happier users who don’t defect to Amazon or wherever. Clicking on one of the promoted categories on the homepage takes you to a page showing you the various product ranges in that section. This is easy enough to navigate through but it doesn’t really stand out, and many of the links are hidden beneath the fold. The navigation bar would have been better placed along the top of the page, where it is easy to see, instead of putting the dropdown menu there. This is a more prominent position, and where many web users would expect to find it. One thing that is lacking on the site is options to filter out and narrow down products from search results and on the various category pages. Effective feature filtering allows shoppers to find the products they want more easily by removing irrelevant products from the results. When an e-commerce site has hundreds of products to display, these tools are essential. For instance, if I search for ‘Mickey Mouse’ I am presented with 71 products spread over five pages to look through with no way of sorting these results, not even by price or alphabetical order. Which is all a bit Web 0.2. This means that customers have to search through too many products, which could easily be avoided. Fixing this is an easy win for Disney. The product pages are pretty basic, with very little information provided about the items on sale. There is little in the way of textual content, leaving hardly any food for Googlebot to eat, which won’t be too good for Disney’s search rankings. On the search rankings front, this page doesn’t show up in the top ten on Google for a search on the exact product name, when it should be right at the top. The photos are fairly poor too; there was only one small photo on all the product pages I looked at, which makes the zoom tools redundant. The ‘add to basket’ link is clear enough, but there is plenty of crucial information missing from these pages: delivery charges and details are not made clear, while links to further information on privacy and security policies are unavailable. Other useful additions would be user reviews, which can provide valuable first hand information as well as helping to boost conversion rates while, with some products likes DVDs and games, video would be a useful sales tool to add to the page. The shopping basket design is basic and, like the product pages, could do with some more information for shoppers. Delivery charges and other related information are also missing from the shopping basket page. People need to see this information before they enter the checkout, as this forms a key part of the purchase decision. If Disney has a high checkout abandonment rate then it could simply be because people are proceeding down that route simply to find out this information, before backing out (rather than the checkout design being at fault, per se). There is a much clearer basket icon at the left hand side of the page, though I missed this initially as it isn’t where you normally expect to find it. Perhaps it would be better placed above the fold on the right of the page. Disney keeps the checkout process down to three steps, which is great for easing shoppers’ frustration, but there are a few omissions. For the first two steps of the process, Disney does not enclose the checkout, meaning that customers can easily click on a link to another section of the website and lose the information they have entered. The idea behind enclosing the checkout is to focus customers’ minds on what they need to do to complete the purchase, as well as preventing them from losing the address information they have added if they click elsewhere. On the final stage of the process, the site has done a good job of removing all distractions, though this should have been implemented for the first two steps as well. Delivery options are among the most important factors in the decision to purchase online: customers need to know that charges are not too high, and that they can have their goods delivered at a time and date which is convenient for them. This means that customers should be told up front about charges and delivery times so they can use this information to decide whether or not to buy. Offering 12 hour delivery slots is not very flexible, and I can see why many people may abandon their purchase at this point. When most other etailers can offer the choice of AM or PM delivery, this is simply not good enough. Worse still, the site doesn’t even specify the date on which people will have to wait in for 12 hours, offering the choice of up to five working days, or up to two, depending how much you pay. This is far from ideal. There are some positive features on the site; I like the way a prominent contact number is displayed on every page of the site for customer services. This is useful for anyone with a query about a product they are thinking of buying, or if they prefer to order by phone. However, there are a lot of e-commerce best practices that this website is failing to learn from. Disney is a huge and very popular brand, and with a little more care taken over the user experience, search optimisation, and a few tweaks here and there, it’s easy to see how this website could seriously improve its conversion rates. 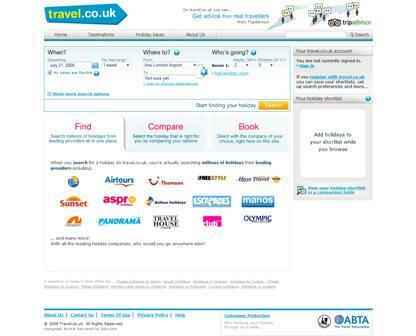 Travel.co.uk is the latest entrant into the travel comparison market, having launched last week with a website that compares package holidays from some of the UK’s top tour operators and travel agents. Google’s Flash indexing – good or bad for SEO? Flash sites can be a nightmare from a user experience perspective, so we were surprised by Google’s decision this week to begin to indexing content from Flash files (SWF). One major argument against the use of Flash has been that the major search engines have been unable to effectively index the content contained within these files, so websites using this software have been losing out in the search rankings. But the main arguments are that Flash sites are often inaccessible and their architects often try to reinvent the wheel, which leads to all manner of user experience nightmares. Is the downturn leading to greater use of e-commerce? Evidence suggests that as more people are feeling the pinch of higher fuel and household bills, they are seeking savings online. Could greater use of e-commerce be a silver lining to the cloud of the Credit Crunch?